What if “healthy” could become your default mode? Where instead of grappling with the cheeseburger vs. the kale caesar, you almost always go with the kale. Where instead of letting your commitment to “being good” fall to the wayside, you plan out the healthy choices and activities in advance. Where instead of wishing you had time to go to the gym or attend your favorite workout class, or even take a walk you make the time. Where instead of falling back into your old habit of putting “healthy” off until tomorrow, you embrace it fully right now. Truth is, there will likely never be a moment where your day isn’t full of to-dos – because that’s just who you are and how you roll. So, here’s an idea. Let’s work with the busy-ness. Let’s identify the little nooks of time and use them wisely so that you can finally design the clean routine that’s seemed like a pipe dream, and experience the fitness, the flavor, and the fun in a healthy lifestyle. A 3-month coaching experience designed to shift you out of inconsistent attempts at healthy living into a clean and true lifestyle that’s sustainable, realistic, and strategic. In collaboration together, we’ll shine a light on the moment-to-moment habits and self-sabotaging behaviors that are keeping you stuck in a body that doesn’t feel fully you. And then, we’ll get to work building a strategy to help you not only break away from them, but also replace them with something better. Before your first session, you’ll be given a health history form to fill out and be asked to keep a wellness journal for one week so that we can see the bigger picture, what you’re currently eating, how you’re sleeping, and what habits you have or have not yet established. The first step in initiating any kind of transformation is awareness. That’s why our first session will be devoted to identifying not only your goals, but also the barriers you currently face in achieving them. In this 1 hour session, we’ll dig deeper to discover what’s really getting in the way of you having the body, the energy, the sleep, or the joy you really want. Following our initial deep dive, we’ll connect every other week to discuss your progress and plan out your weekly schedule to ensure you’re prepared for a healthy week (or trip) ahead. In these sessions, I’ll reveal my health hacks and tricks to eating healthy, squeezing in exercise, and capitalizing on small moments to relax. Connect with another wellness expert who specializes in the very thing you may need more of, whether that’s a Personal Stylist, Personal Chef, or Personal Fitness Instructor (yoga, meditation, general fitness), all available through virtual instruction. In between our sessions, I’ll be available via text or email to help you navigate those emergency moments, like: what meal to choose on the dinner menu, how to avoid the pastries at the office, or ways to calm down after a stressful situation at work. I’m here to support you every step of the way so that it’s easier to transform your habits. 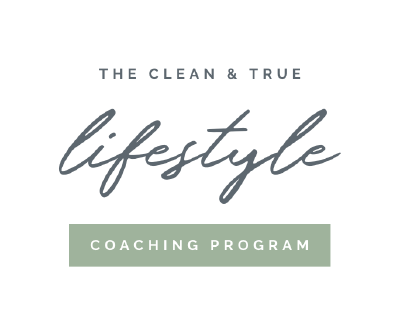 If you’re ready to feel better, to experience a deep sense of confidence, poise, and inner joy about how you look, the Clean + True Lifestyle Program was made for you. Schedule your complimentary 30-minute consult to learn more. Ready to Start Designing Your Healthy Balance? 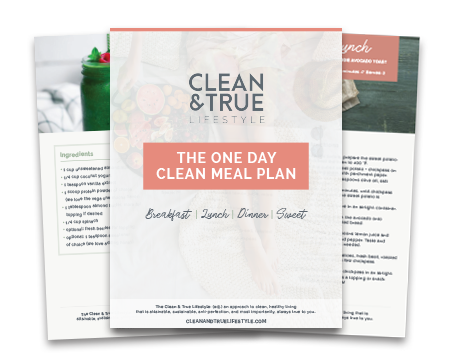 Download my One-Day Meal Plan Snapshot, complete with 3 recipes, 1 snack, a shopping list and other recommendations for a healthy weekday. Enter your email below to get it sent directly to your inbox!